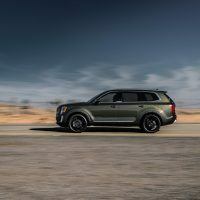 2020 Kia Telluride debuts at the North American International Auto Show. 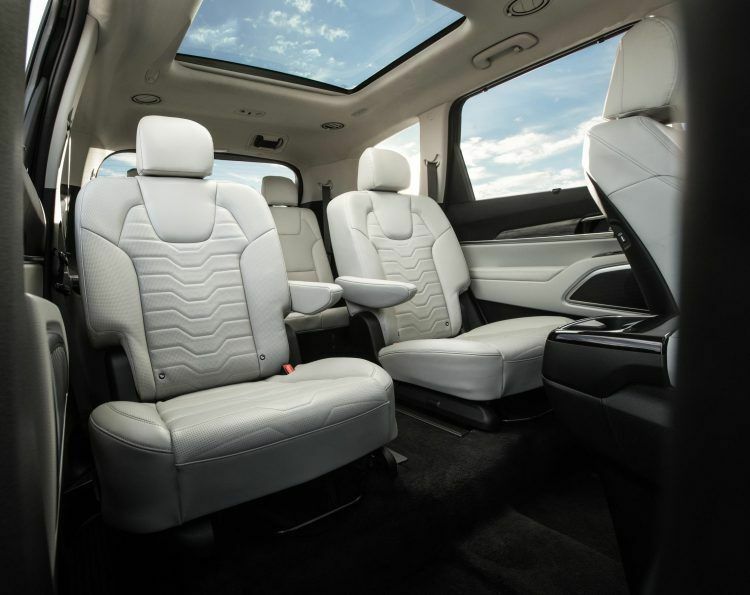 The Telluride is a luxurious and rugged family SUV with seating for eight. The 3.8-liter GDI V6 motor can tow 5,000 lbs. All-wheel drive is available. Well, look what we have here. The 2020 Kia Telluride. I and the rest of the guys here at Automoblog got our first glimpse of the Telluride during the 2018 New York Fashion Week. It graced Brandon Maxwell’s Texas-inspired fashion collection, so it naturally came with rugged accoutrements like a hatch-mounted spare tire and snorkel. Sadly, that particular Telluride is a one-off version. Back then, the Kia Telluride had impressive credentials. My first impression was that of a large, luxurious family SUV with true off-road credentials. From this alone, Kia has struck the nail right on the head. 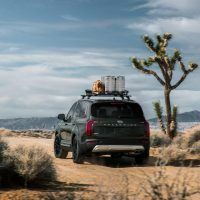 Telluride is the first Kia designed specifically for the United States by the Kia Design Center in Irvine, California. Photo: Kia Motors America. Currently, both import and domestic carmakers are scrambling for position. The plan is to release as many sport utility vehicles and pickup trucks as possible, two of the best-selling vehicles globally. Kia – along with parent company Hyundai – made the right choice in conceptualizing a large SUV. They didn’t want to settle for a one-trick-pony crossover. And as Hyundai is presenting the Palisade as a refined type of behemoth, Kia went the other way around with the Telluride. Think Rob Gronkowski instead of Tom Brady and you’re not far off. Here is a rugged SUV that can hack it over rougher roads and uneven pavement. 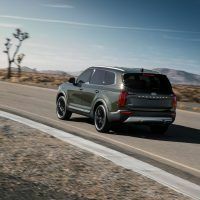 But it also offers a level of safety tech and luxury that rivals premium offerings like the Range Rover Discovery and Audi Q7. Kia equipped the new Telluride with a 3.8-liter gasoline V6 with direct injection. It is good for 291 horsepower and 262 lb-ft. of torque. Power is fed to the front wheels via an eight-speed automatic, but the Telluride is available with an active on-demand all-wheel drive system. Interestingly enough, the Hyundai Palisade is also equipped with the very same motor as the Telluride. 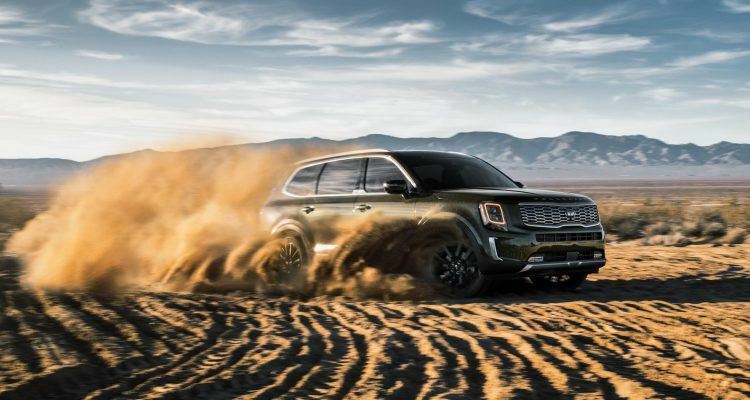 The 2020 Kia Telluride comes with four drive modes: Smart, Eco, Sport, and Comfort. Each setting will feed electrons to the steering, powertrain, and drivetrain accordingly. The new Telluride can tow up to 5,000 lbs., which is just about right for a luxury-based SUV. 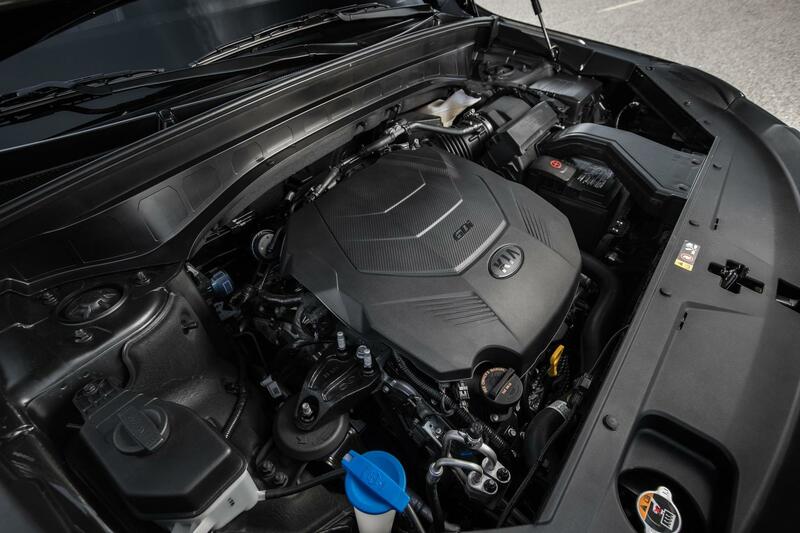 The 2020 Kia Telluride comes with a 291 horsepower, 3.8-liter GDI V6 motor. Photo: Kia Motors America. Compared to the Telluride concept car, the production model is a bit shorter and smaller. Kia also gave the new Telluride a more squared-off look. This helps to further differentiate the Telluride from the Hyundai Palisade. And even though the Palisade and Telluride are based on the same platform, Kia is quick to point out that both vehicles share zero exterior panels. Viewed from the side, the rounded fenders and large alloys command attention. There’s no doubt the Telluride is a looker, which is a nice thing to have in a hulking SUV. With a long, broad hood and wide front grille, the new Telluride exudes a rugged elegance. The stacked headlights and upright windshield convey power, authority, and modernity. Further enhancing the go-anywhere appeal are the Telluride badges on the hood and liftgate. The rear is adorned with inverted L-shaped taillights with LED stripes and a sculpted rear skid plate. The 2020 Kia Telluride is also equipped with twin exhaust tips. Thankfully, they’re not the fake kind. 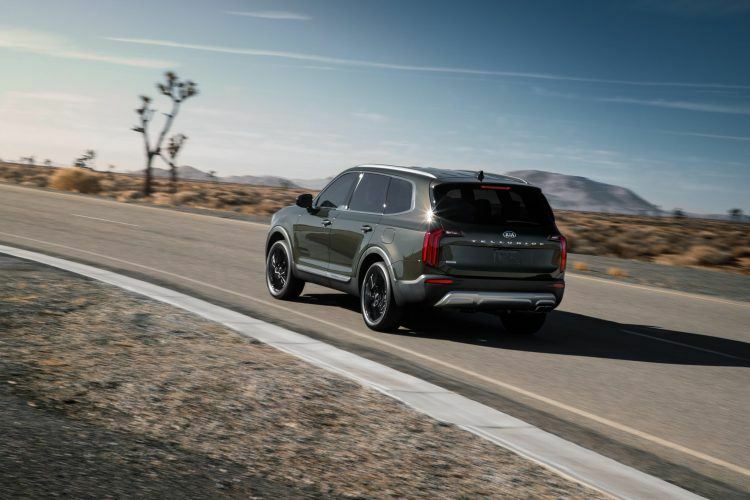 The 2020 Kia Telluride features L-shaped LED tailights, a rear skid plate, and twin exhaust tips. Photo: Kia Motors America. Kia utilized all the tricks in the book to come up with a luxurious and plush interior, but the Hyundai Palisade is more high-tech with its push-button shifter and larger 12-inch touchscreen. Despite this fact, Kia didn’t skimp on soft-touch materials, sumptuous leather, and comfortable seats. As a result, the Telluride’s interior is a nice place to be. Most importantly, it offers generous interior room to move around. In fact, the cabin is roomy enough to accommodate eight adults. The interior is bathed in matte-finished wood and brushed metal trimming. The tilt-and-telescoping steering wheel is wrapped in cowhide. Apple CarPlay and Android Auto are standard along with Bluetooth connectivity and a remote-start. Higher trim models receive Kia’s UVO telematics system. This allows you to monitor and control vehicle settings using your smartphone or laptop. 2020 Kia Telluride interior layout. Photo: Kia Motors America. 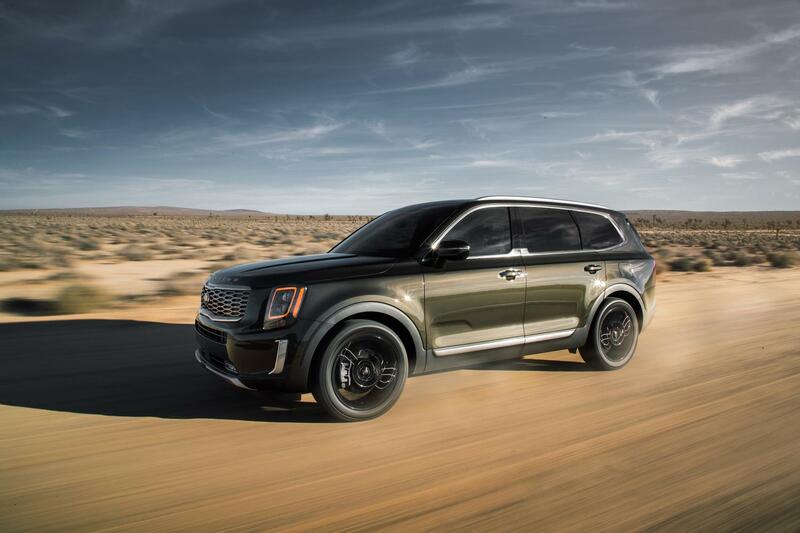 The 2020 Kia Telluride comes standard with anti lock braking, stability control, stability management, downhill brake control, hill-start assist, and a tire pressure monitoring system. The Kia Drive Wise system includes forward collision warning, collision avoidance, lane departure warning, lane keeping assist, blind spot monitoring, and smart cruise control among others. Assembly for the 2020 Kia Telluride is at the Georgia West Point plant. The base Telluride LX starts at $31,690 and comes with middle bench seats, leatherette seat trim, and smart key with push button start. The S trim starts at $33,990 and can be optioned with captain’s chairs in the second row. Also included are heated front seats, a power sunroof, and 20-inch wheels. The Telluride EX has a base price of $37,090 and includes a smart power liftgate, 10.25-inch touchscreen with UVO link and navigation, and sumptuous leather seats. The SX trim is a veritable bargain at $41,490 and comes with dual sunroofs, LED projector headlights, 20-inch black alloy wheels, and a surround view camera system. 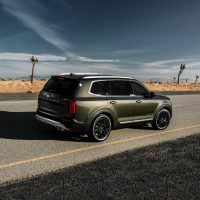 Fancy the new 2020 Kia Telluride? It arrives at Kia dealerships in spring. 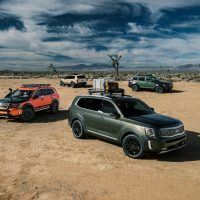 No Comments on "2020 Kia Telluride: The South Korean Range Rover"